Reliable hygiene: No installed fittings or constrictions, which also means there are no empty spaces in the measuring tube. Reduced maintenance workload: No maintenance is necessary, which reduces operating costs. Reduced energy consumption: FLOWave requires much less energy in operation compared to measurement devices of comparable performance. Compact design: The compact size and low weight enable easy installation in the control cabinet. Absolute care is essential in pharmaceutical production – after all, people’s lives and health depend on the correct agent composition and the avoidance of contamination. With the aid of the FLOWave Type 8098 flowmeter, the universal pharmaceutical cleaning system PUR of L.B. 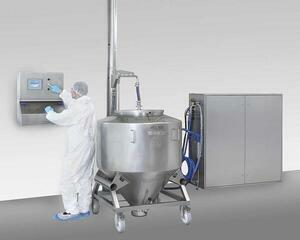 Bohle Maschinen + Verfahren GmbH can quickly and simply satisfy these high hygiene standards. L.B. Bohle, which is based in the Westphalian town of Enningerloh, is among the leading engineering companies of special-purpose machinery for the pharmaceutical industry. Its product portfolio encompasses machines and plants for the production of pharmaceutical products for processes ranging from weighing, granulating, sieving and mixing to the film coating of tablets and the corresponding cleaning equipment. The PUR universal pharmaceutical cleaning system is designed specifically for cleaning containers of a variety of sizes and has an impressively compact construction. All of the components for transporting and treating the cleaning water are stored within a compact stainless steel cabinet. Washing processes are performed on the basis of recipes and are automatically logged. A touch panel on the device enables convenient local operation. The recipes for the various cleaning processes and steps specify the volume proportions of the water relative to the alkaline or acidic cleaning agents. Many cleaning processes also specify specific temperature levels in the recipes to optimise the process. This means that not only does the water volume have to be continuously monitored in the PUR systems, the temperature also has to be measured and adjusted as appropriate. 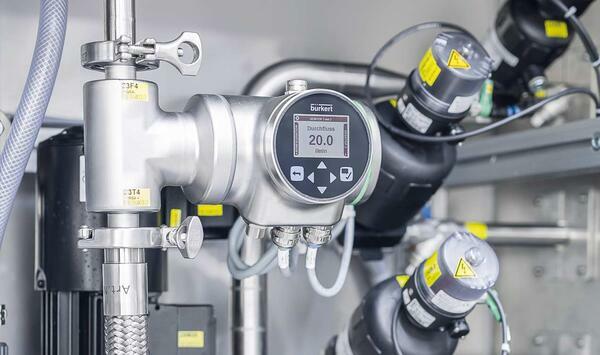 Bürkert’s FLOWave Type 8098 flowmeter can perform both tasks. It measures the volume flow and has an integrated temperature sensor. This reduces the need for a sensor in the PUR systems, which saves space and limits the range of components present. This in turn enables hygiene standards to be quickly met, because a device does not need to undergo cleaning cycles as often. The flowmeter is completely made of stainless steel and measures volume flow rates with a precision of ± 0.4 % of the measured value. The temperature is measured concurrently with this with a precision of ≤ 1 °C. Depending on the orifice size, the nominal pressure can be up to 40 bar. The temperature range is designed so that both CIP and SIP cleaning processes can be performed. In addition to the measurement of volume flow rates and temperatures, FLOWave can perform other measurements to provide values such as density factors (for liquid detection) and acoustic transmission factors (for gas bubble detection). The latter is also of interest to L.B. Bohle for the purpose of further optimising the cleaning process in future. Thanks to the patented SAW technology, FLOWave dispenses entirely with sensor elements in the measuring tube that come into contact with the substance to be measured. This means that the fluids to be measured do not come into contact with the sensor elements and there is no empty space. As a result, FLOWave measures the flow rate under completely hygienic conditions. Because the measuring tube is no different than any other straight pipe piece for flow purposes, there is also no pressure drop. The measurement works regardless of whether the fluids are immobile, flowing quickly or alternating. The compact size and low weight also enable easy installation in the control cabinet. It can be installed in any desired direction, allowing the display to be adjusted for comfortable reading. During operation, the flowmeter consumes much less energy than a Coriolis flowmeter, for instance, which is also a much larger and heavier construction. There is also no maintenance work necessary, which significantly reduces the operating costs among users of PUR systems.